A motorist is under arrest after a road rage incident that was reported to go for 40 blocks that ended with a bike run over and man injured on 11th Street and 57th Street in Manhattan Wednesday morning. An apparent road rage confrontation in midtown completely demolished a motorcycle and put its driver in the hospital after he was allegedly run over Wednesday morning. The altercation occurred just shortly after 7:30 a.m. at the intersection of W 57th Street and 11th Avenue, authorities say, adding that the confrontation started with a verbal argument over erratic driving. 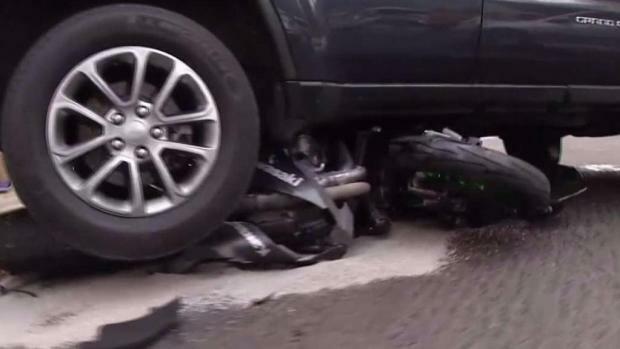 In exclusive video by sister station Telemundo 47, a mangled motorcycle can be seen pinned underneath an SUV as the driver tries to move the vehicle. The road rage incident apparently took place over 40 city blocks. Oscar Bejar, 31, driver of the SUV, told Telemundo 47 that it all started at 100th Street and moved down to 96th street where he asked the motorcyclist why he was chasing him, until culminating with an accident and fistfight at 57th Street. At least one motorist is under arrest after a road rage incident that was reported to go for 40 blocks, ending with a bike run over and man injured on 11th Street and 57th Street in Manhattan Wednesday morning. 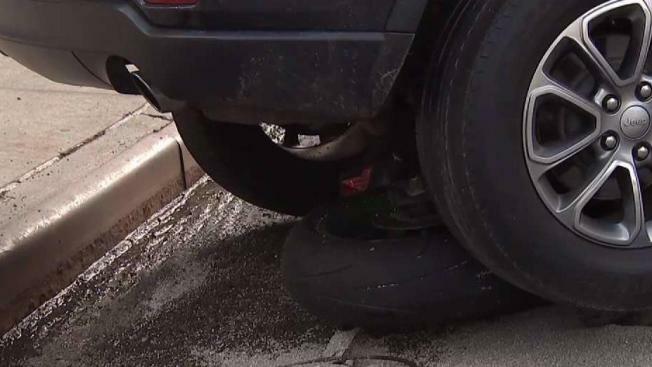 “I was just driving down and he stops me…slaps my mirror, scrapes my car with his motorcycle, I thought he was going to do something again so I tried to turn away…I was scared he was going to hit me, he was at my driver’s window,” Bejar said at the location of the incident. Bejar says he drove over the motorcycle because he was afraid the rider would damage his car again. The victim, who identified himself only as Carlos, was sitting in the sidewalk with bloody knees until emergency personnel arrived on scene, evaluated him and took him to the hospital with minor injuries. Carlos says Bejar was lying and that it was Bejar who was allegedly harassing him and trying to cut him off by using the opposite traffic lane to pass him until he eventually managed to run him over. Authorities arrested Bejar. He is charged with serious injury with a weapon (car), criminal mischief, menacing, reckless endangerment and reckless driving. The motorcyclist has not been charged. It was not immediately clear if Bejar retained an attorney who could comment on the charges.